The majority of people live in cities. To encourage new families to embrace urban domestic life, and not move to low-density suburbs, cities need to be designed to support the healthy development of children and the adults that care for them. New policies are needed to support the healthy development of children, to motivate their independent mobility outdoors where they can engage with the natural world. 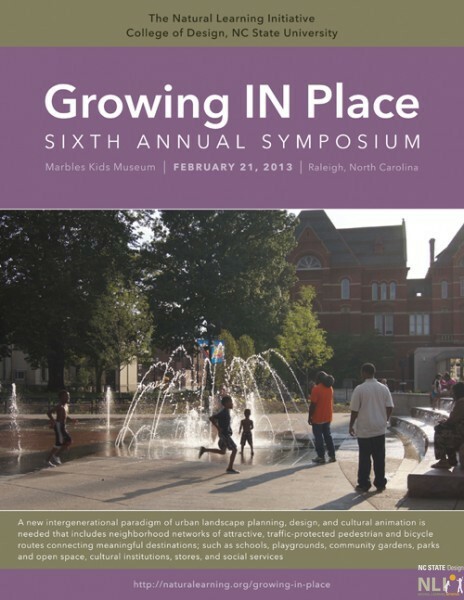 A new intergenerational paradigm of urban landscape planning, design, and cultural animation is needed that includes neighborhood networks of attractive, traffic-protected pedestrian and bicycle routes connecting meaningful destinations; such as schools, playgrounds, community gardens, parks and open space, cultural institutions, stores, and social services. Vikas Mehta, PhD, School of Architecture & Community Design, University of South Florida, author of The Street: A Quintessential Social Public Space, Creating Lively Community Streets. Lauren Blackburn, AICP, MURP, Bike/Ped Division Director, NC Department of Transportation, Active Transportation for All. Ed Johnson, RLA, ASLA, Safe Routes to School Coordinator, NC DOT, Division of Bicycle and Pedestrian Transportation, Implementing Safe Routes to and from School in North Carolina. Kathy Bull, Director of Marketing and Development, Children & Nature Network, Bringing Nature to City Kids: Update on the Children and Nature Movement. Liz O’Brien, BSc, PhD, Deputy Head of Social and Economic Research Group, Centre for Human and Ecological Science, Great Britain Forestry Commission, Creating Playful, Family-friendly Urban Green Infrastructure Programs and Policies. Laura Lawson, PhD, Professor and Chair, Department of Landscape Architecture, Rutgers State University of New Jersey, co-author of Greening Cities Growing Communities, It’s Not Just About Food: The Multiple Roles of Urban Community Gardens. Pamela Wridt, PhD, Co-Director, Children’s Environments Research Group, The Center for Human Environments, The Graduate Center of the City University of New York, Engaging Children and Youth in Neighborhood Change.